Wide World of Shred finally comes back to the start: snow. Utah comes through big time with this early season storm. There are now already videos up of what looks like a hell of a lot more than a light "dusting." Plenty shredable snow and rail jam occurs in these hooligans' videos. Alright after watching the new show on SpikeTV, Surviving Disaster, this video is that much more amazing. Last night's episode was on surviving, after one of your buddies receives a severe ski injury. Of course, then bears and avalanches chase them. This video here is real and insane. Watch through for the whole thing, it is well worth it. I might have jumped the gun yesterday. 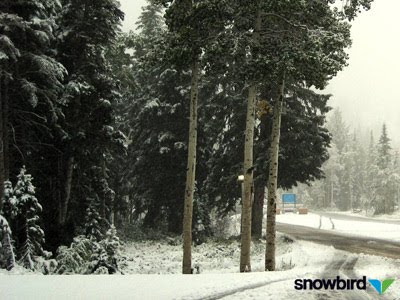 It looks like the snow winner is going to of course be, Snowbird!!! According to their pic of the day, things are shaping up to be great. While I don't know if this is the first snowfall of the season, it is certainly the first I've caught wind of. They say the location of this is in Cottonwood Canyon. Giddyup. It's only a 34 hour Subaru ride from D.C. to Utah. Who is in for a few weeks living in a car out West? Is there a better sight than a snow filled canyon road? While it makes for gnarly driving, it opens up all sorts of possibilities. Soon, we'll be talking about the season's plans, layering, gortex, new gear, new slopes, runs, video, and pictures for the 2010 shred season. Boloney Moguls: coming to a slope near you. UPDATE: Jackson Hole's FB page confirms the storm is rolling in up there too. 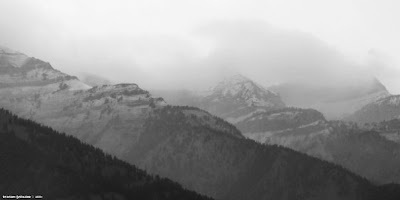 Tetons and the Wasatch being hit on the same day. Will there be some accumulation at the higher altitudes? We've got to hope. Weather reports are proving that Ullr the snow god is preparing to unleash his load all over the Grand Tetons. Winter is coming. 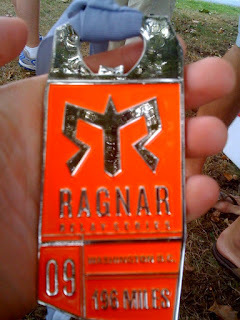 After over 30 hours of running and minimal sleep, Team Beer Run crushed the Ragnar Relay of 200 miles. I had a great team and many beers were consumed. For a full run down on the day and a quarter Ragnasty event, check out the live blog we were updating the entire relay.